Extra Large Size: 200x200cm which is about 79×79 inch, perfect for 5-6 adults sitting or 3-4 adults laying,can fit your whole family. Waterproof Aluminum Backing: Not only will this keep the top of the blanket from getting wet, but it is very easy to wipe clean,also keep you warm if caught out in the cold. Soft Fleece Surface: Three layers with high quality materials (100% Polyester on top and PE+Aluminum material, Foam is on middle layer), no chemical smell. Foldable and Portable: This picnic mat folding size is about 43x29x15cm, easy to roll up with lightweight to carry. 4mm thickness, super soft and comfortable to sit or lay on, perfect for picnic,camping,hiking and any outdoor activities. 1. How Large and how thick is this blanket ? 4mm thickness. easy to carry on and confortable to sit or lay on. 2. Does it have bad smell and how quiet is this blanket ? No, it has no chemical smell at all, and it has foam on the middle, very little sound when folding or sitting. 3. Can i use it for beach mat ? Yes, it is ideal for all outdoor and indoor activities such as picnics, BBQ, camping, beach, music festivals or sporting events. Also extremely useful as a vehicle upholstery protector for your pets. 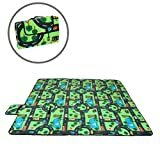 Also makes a perfect baby crawling mat or child play mat. 4. Is this machine washable ? How can i wash it ? Wash and Clean: Top layer can be wiped slightly with warm water and mild soap; Bottom waterproof layer can be cleaned by damp cloth;naturally air dried and line dry in the air will be fine.